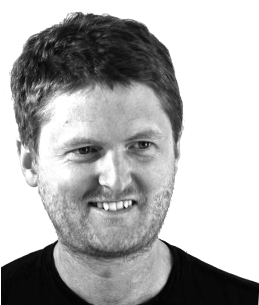 Popular grandstand sell out fast. Buy Spanish Grand Prix tickets from these official retailers. 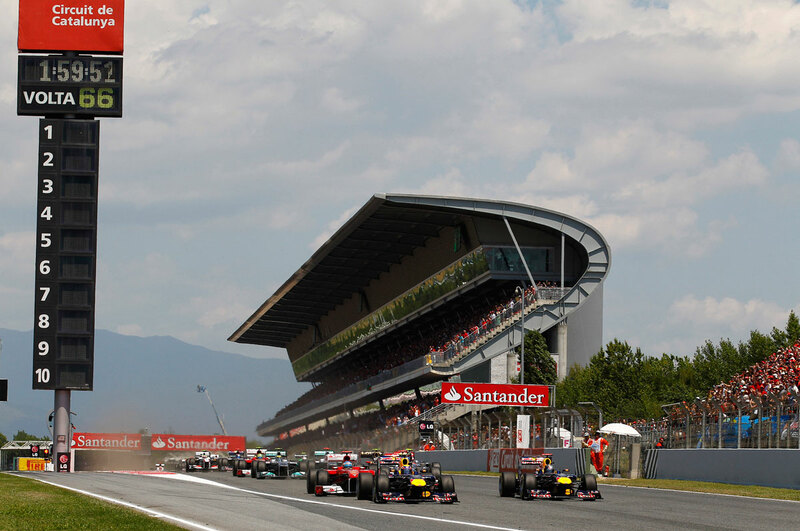 Spectator views at the Spanish Grand Prix are among the best of any race track in Europe. General admission is incredible value for money and some of the vantage points from the stadium section of the circuit are exceptional. Many of the grandstands at the Circuit de Catalunya offer impressive views of large sweeping sections of track and multiple corners. Although only two grandstands are covered they are all fitted with molded plastic seats with seatbacks which offer more comfort than general admission for what is potentially a long, hot day. 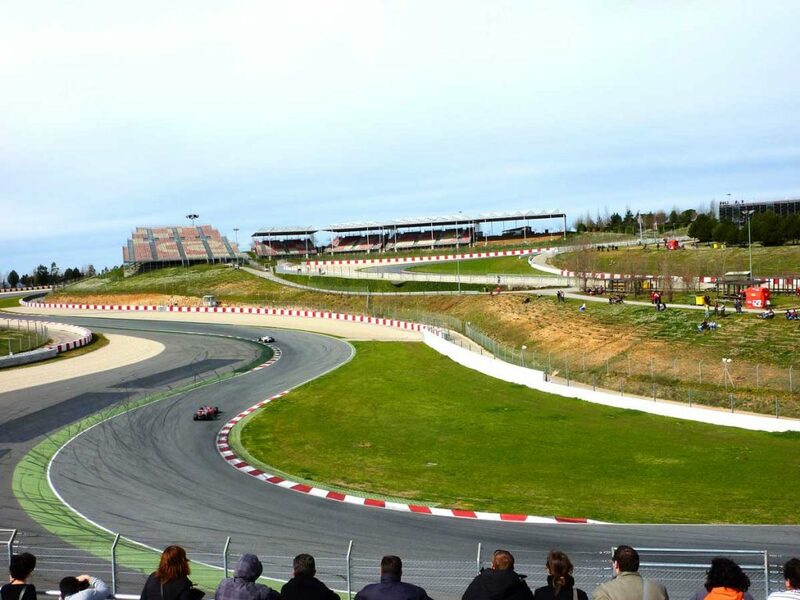 On what is one of the longest pit straights in Formula One, fans seated here can enjoy all the expected perks like pit stops, the start and finish. If sitting around in the sun gets too much to bear you don’t have far to go to find a cold drink – most of the refreshment as well as merchandise and entertainment stalls are close by. When there’s no action on track close your eyes and reminisce about Mansell and Senna going wheel to wheel down here, sparks flying in the 1991 Grand Prix. The main grandstand at the Circuit de Catalunya is of course the best place to enjoy the build up on the grid, the start, pitlane activity and watch the winner take the checkered flag. For most fans there are no views of any corners other than on the accompanying giant screens though seats high up on the left side of the stand can make out turn 1 and a section of the infield at a distance. Towards the end of the lap you might catch glimpses of the cars through the trees but its nothing to get excited about. Perhaps the best perk for fans sat here though – the roof. Its one of few grandstands at the Barcelona track that is covered and some of the venues northern European visitors especially might appreciate this feature. Grandstand J occupies a no-mans land between the start/finish line and turn one. It is a little too distant to see the grid preparations and the start as well as any meaningful view of turn one, but you will get to see some pit stops and the pit exit is just opposite seats in the right hand side of the stand. Looking across to the infield section you see the cars exit turn 5, take on the sweeping turn 6 and disappear behind a grandstand. Overtaking is not common around the Circuit de Catalunya but following the long main straight, with DRS assistance, changes for position can happen at turn 1. This is the most likely part of the track to see Formula One cars going wheel to wheel. The infield section around turns 5, 6 and 7 pass very close to the main start finish straight which is great for spectators in these areas as they get to watch not just the part of the action in turn 1 but can follow the action happening later in the lap as well. Grandstand K is arguably the best grandstand in this group giving spectators a good balance of views to the infield and of the first sequence of corners. Coming off the main straight you’ll see cars braking hard into turn 1 which though distant will allow you to see any overtakes that might take place here. From here watch as the drivers accerate, snaking around turns 2 and 3. Its for the views of the infield section that the grandstand really excels though. Without anything blocking the track you clearly see cars from the exit of turn 5 as far as the turn in to turn 9. At many tracks the view from Grandstand F would come highly recommended so its a testament to the high standard of grandstands that prevail at the Catalunya circuit that this stand is, well, a bit average. This is undoubtedly one of the best grandstands for close-up views of overtaking into turn 1 as it stands, well positioned at the apex to the corner. Then follow the action around turn 2 and disappearing around turn 3. Seats in the upper rows will have no issues seeing over the catch fencing after the point of turn in though the top of the fence does cover the racing line on the approach. Whatever you see of the cars in the infield section from turn 5 to 7 will really be just a glimpse. 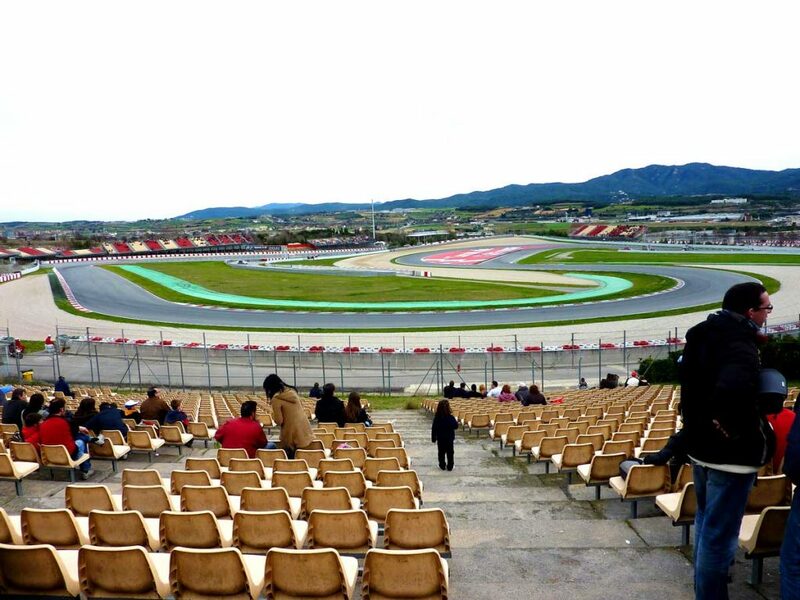 There are better grandstands available at the Spanish GP but this is nonetheless a solid choice. Grandstand A is certainly one of the best choice of grandstands for the tumult into turn 1 on the opening lap, having views that stretch far down the pit straight. Though the track is more distant from here that Grandstand F, the view is more panoramic and the safety fencing is never a problem meaning you’ll be able to get plenty of clear photos of the cars to remember your weekend. Looking across the grandstand to your left you’ll see a glimpse of the cars disappearing around the magnificent turn 3. Later in the lap you’ll see them reappear in the distance at the entry to turn 5, though unfortunately the angle of the grandstand doesn’t allow for any more views of the infield section. Grandstand L is a one of a kind grandstand from where fans are treated to views of a giant chunk of the Cataluya circuit. The grandstand is positioned on the interior of the track, literally wedged in the small area between the entry to turn 3 at the beginning of the lap and turn 5 in the interior. The view up the main straight extends almost as far as the lights and the view of the interior includes all of the track between turn 4 and the entry to turn 7. Spectators lucky enough to be on the back row even have a view behind the grandstand that includes most of turn 3. This is not an overtaking spot and as a single corner view things will get repetitive after a while but turn 9 is a high speed, exciting corner and a crucial corner to get right before entering the long back straight. After the long back straight drivers enter a series of medium to low speed corners that make up a stadium section towards the end of the lap. Many spectators fill the grandstands B, C G and H that enjoy views over numerous corners and the atmosphere here is always electric. Though not a typical part of the track for overtaking, there has been some close racing here over the years. Stretching around turn 12, 24 block Grandstand G is a mammoth grandstand with some of the best views or the circuit. Blocks 18 – 24 of he stand have an expansive view of the track from La Caixxa to the pitlane entry and the final turn 16, providing ample opportunity to appreciate the racing over a number of varying types of corners and for a generous duration of time. Blocks 1 – 18 fare slightly worse with views only extending as far as turn 13. 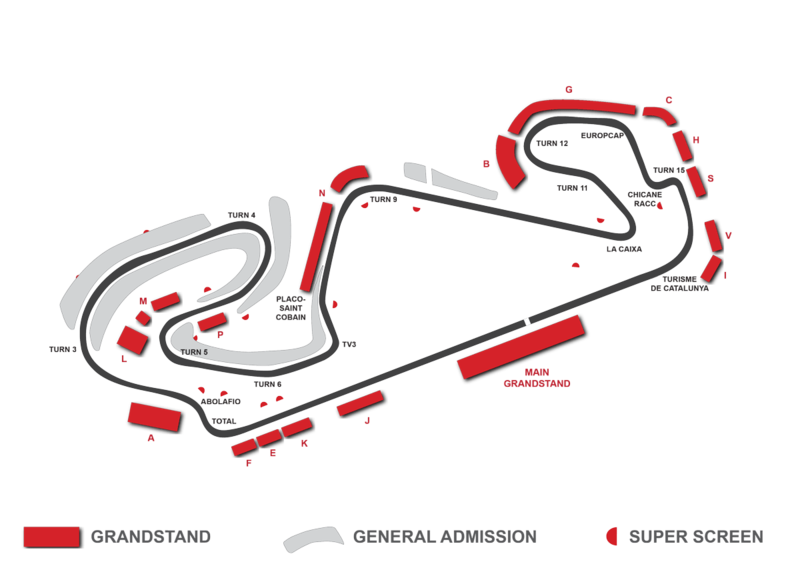 The obvious downside here is the generally low speeds and low likelihood of overtaking, but having such a panoramic view of so much of the circuit, few fans will be disappointed. A very similar portion of the track can be seen from Grandstand H, but from a different direction. These seats are opposite the final tight chicane and with the low speeds and no catch fence is a clear winner for shutter bugs seeking the perfect photos from their day at the track. This grandstand gave Grandstand L a close run for best grandstand at the Barcelona circuit. Really the only choice for anyone seeking a covered grandstand and wanting a more varied view than what the main grandstand offers. From here you’ll have a view that traces the on track action from the approach to the chicane and around the tricky final turn onto the start / finish straight. The final fast right hander is crucial in qualifying as drivers aim to make every 10th count on there way to the line and in the race drivers will want to perfect this turn for the best chance of overtaking in turn 1. During the buildup to the race you’ll see the teams preparing on the grid and later on you can see some of the action in the pitlane, though it is distant. There are certainly better views to be had at the Spanish Grand Prix but none that won’t have you admitted to the nearest burns unit by the end of the weekend. Come the end of the race you’re ideally located for the track invasion and the sprint down the track to the podium. 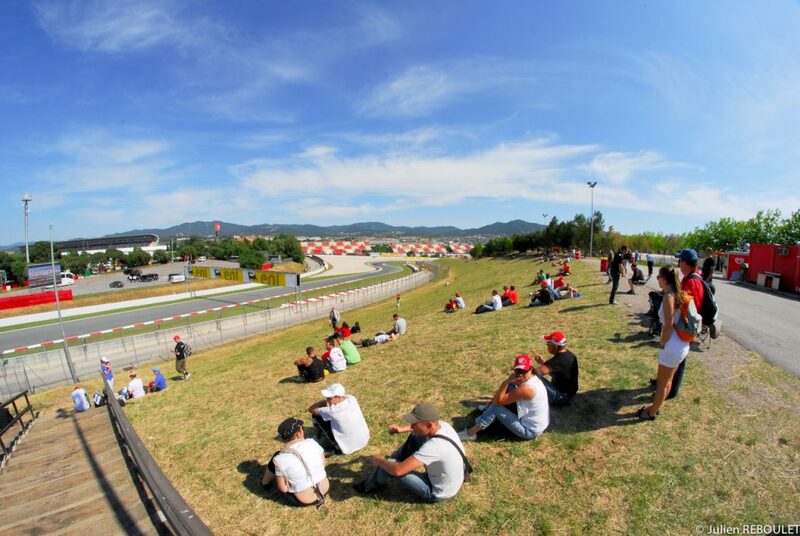 It’s hard though to justify the vast price difference the step up to a grandstand entails and General Admission at the Circuit de Catalunya is a worthwhile option boasting many and varied viewing areas. There are views of the circuit that are close to the circuit in places and allow broader, more expansive views of the track in others. Situated on sloped grassy areas around the circuit, just about the only thing lacking here is comfort. Bear in mind when considering general admission that getting around on these banked viewing platforms is not suitable for anyone who struggles with mobility, are exposed to the often scorching sun and that the best spots will be snapped up as soon as the gates are opened. Basing yourself in the general admission areas around turns 4 and 5 offers some good viewing with an easy walk connecting the two areas meaning you can easily get some variation to your view of the race. Another good choice is the small area in the interior of the track that overlooks turn 1 and 2 and from where some views of the infield section will be possible.